Ideally, you will never have to leave the safety of your boat for the limited confines of your dinghy. Perhaps, if things do not go as planned, this may become your best option. If you get to that point you will want some essential equipment close to hand, ready to take with you. A dinghy ditch kit can be “light and lovely” or it may contain the critical gear you need for an extended period of time. This Tech Talk will focus on ditch kit contents appropriate for coastal cruising and the rationale for carrying certain types of gear. This includes equipment for crew safety as well as equipment that can help you “get found”. 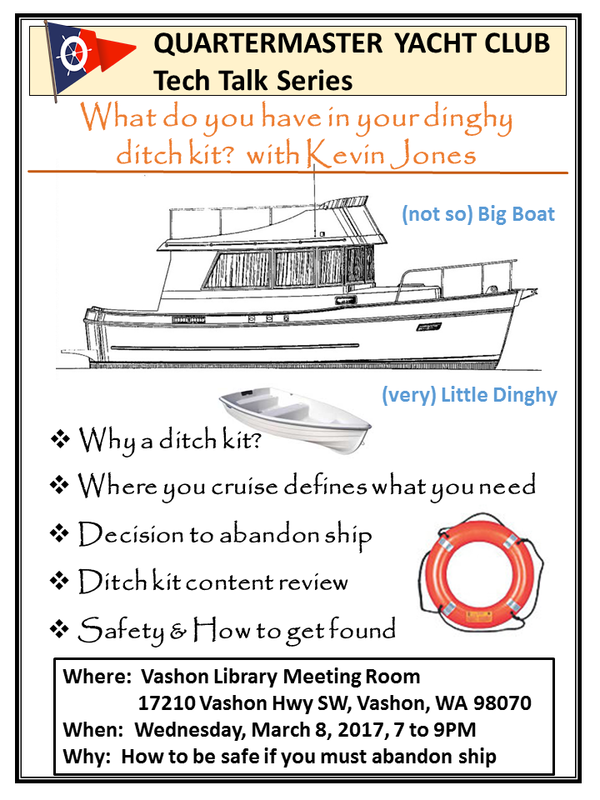 Attend this ditch kit “show and tell” session hosted by Kevin Jones on Wednesday, March 8 at 7PM in the Vashon Library meeting room. Have a dinghy ditch kit? Bring it along and share your ditch kit ideas!